The Islamic Development Bank (IDB) will be raising financing for two projects through crowdfunding, a testament to the Islamic finance industry embracing fintech-driven alternative modes of financing. Working on several fintech initiatives including exploring the potential of an Islamic social cryptocurrency, the IDB has partnered with Kuala Lumpur-based Islamic fintech venture builder Ethis Ventures to utilize the latter’s crowdfunding technology capabilities to raise funds from the public. 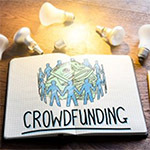 The decision for the international financial institution to utilize crowdfunding underscores the growing acceptance of the asset class as a capital-raising avenue. The World Bank predicted that global investment in crowdfunding will hit US$93 billion by 2025. If the IDB is successful, this could mark the first of many projects to be funded via this model and could attract other multilateral financial institutions to follow suit. The multilateral financier has earmarked two projects for the pilot phase of the partnership: Alliance to Fight Avoidable Blindness and a Reverse Linkage rice production project between the Republic of Suriname and Malaysia. With an initial target of US$1 million, the crowdfunding campaign will begin mid-May through the GlobalSadaqah.com platform.